Time has its function. Time has its reality as a construct that can be worked with. 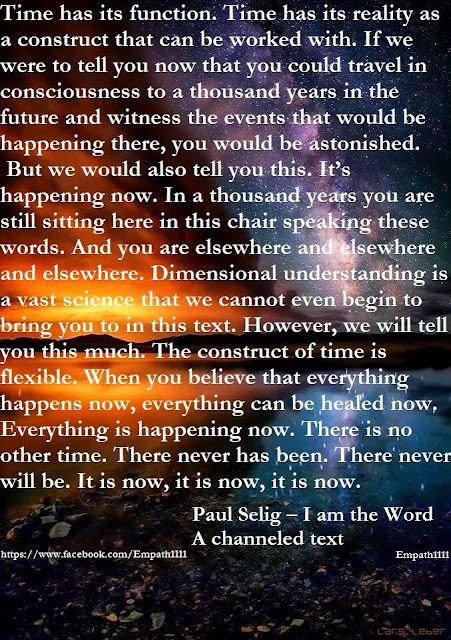 If we were to tell you now that you could travel in consciousness to a thousand years in the future and witness the events that would be happening there, you would be astonished. But we would also tell you this. It’s happening now. In a thousand years you are still sitting here in this chair speaking these words. And you are elsewhere and elsewhere and elsewhere. Dimensional understanding is a vast science that we cannot even begin to bring you to in this text. However, we will tell you this much. The construct of time is flexible. When you believe that everything happens now, everything can be healed now. Everything is happening now. There is no other time. There never has been. There never will be. It is now, it is now, it is now.